The season of Lent holds importance for all Christians, and many denominations practice special eating and fasting customs during this period leading up to Easter—the holiday that celebrates the resurrection of Jesus Christ. Traditionally, Lent is regarded 40 days long, although for Roman Catholics, this period extends over 46 calendar days, since Sundays within the six-week period are exempt and regarded as days of celebration. For Orthodox Catholics, Lent extends for the full 46 days, including all interim Sundays. All devout Catholics of both branches—Roman Catholic and Orthodox—practice various forms of abstinence during Lent, including partial fasting. The general guideline is to consume one full meal a day—or two small meals that "add up" to one full meal. For Eastern Orthodox Catholics, adherence to these dietary guidelines for Lent is particularly diligent. Not only do they engage in limited fasting for every day of the week for six weeks, but the more devout Orthodox Catholics generally abstain from all forms of meat, including the fish that Roman Catholics traditionally have allowed themselves on certain days. There are very clearly defined rules for categories of foods that are allowed or disallowed for Orthodox Catholics, although individual practice does vary widely. But partial fasting and abstinence don't have to mean boring. The Serbian recipes listed below all fall under the allowable foods list and can make for delicious offerings during the single daily meal for each day of Lent. 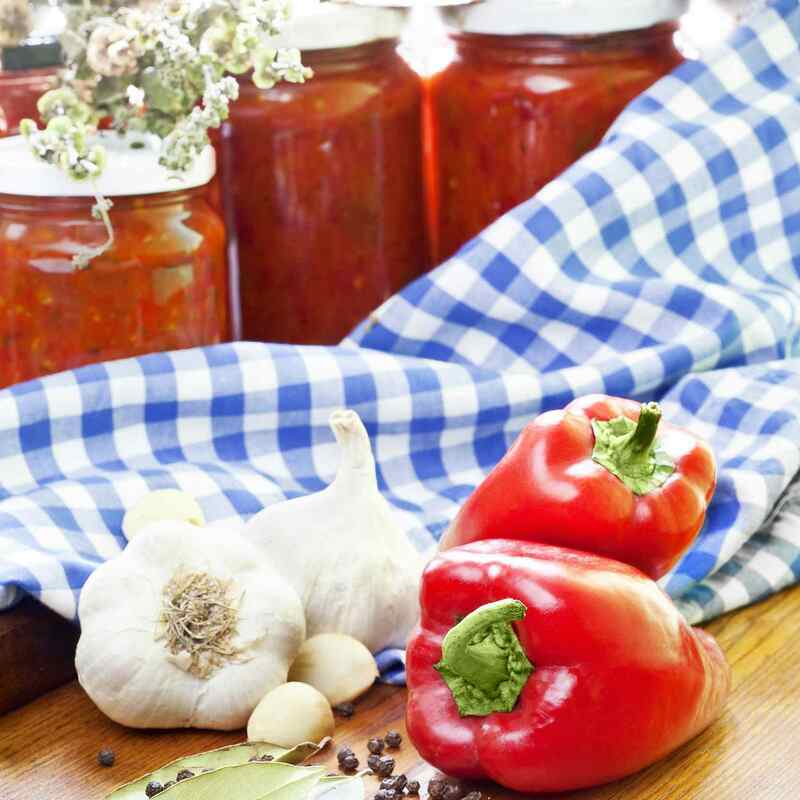 Ajvar is a Croatian/Serbian roasted mixture of eggplant and sweet pepper, sometimes referred to as vegetarian caviar. It can be mashed or left chunky, depending on personal taste, and served as a relish, vegetable, or as a spread to be used on country-style white bread such as Lenten ​pogacha. This recipe for Serbian sweet sauerkraut salad uses oil in addition to the diced peppers, onion, and celery found in this sauerkraut salad recipe. Because it contains no mayonnaise, this recipe is perfect for picnics and cookouts where refrigeration isn't possible. In these recipes for Serbian coleslaw and Serbian potato salad, vinegar and oil are used to dress the shredded cabbage in place of sour cream, mayonnaise, or heavy cream. Thus, it is a perfect warm-weather salad. Some cooks add shredded carrot, while others leave it out entirely. Macaroni replaces the potatoes in this meatless version of Serbian white bean soup—pasulj. If desired, one large peeled and diced potato can be added ​along with the rest of the vegetables to help to thicken the soup. To help reduce some of the liquid, the soup should be left uncovered while cooking. This recipe for Serbian baked beans or prebranac is as much starch as it is vegetable and can be served either as a vegetarian main course or as a side dish. Whole baked fish, fried fish, fish chowders, (squid salad) and bakalar s kumpirom (salt cod with potatoes) are popular options for the Lenten fasting season. This recipe calls for presoaking the cod, which causes it to lose most of its salt. To compensate, it can be flavored with sliced or chopped onion sauteed with garlic, if you wish. For lovers of stuffed cabbage, this sarma recipe includes only vegetables, allowing them to indulge in a favorite food while still following the church's rulings on abstinence. This recipe for Serbian Lenten pogacha (POH-gah-cha), also known as pogaca, uses no eggs, milk or butter, so it is perfect for a fasting meal, like the period before Easter and during Advent, unlike other pogacha recipes.